There is Chogaku-ji Temple in the south of Ishigami Shrine which we introduced last time. Both are along the way of Yamanobeno-michi, and we see a lot of worshipers in hiking style. 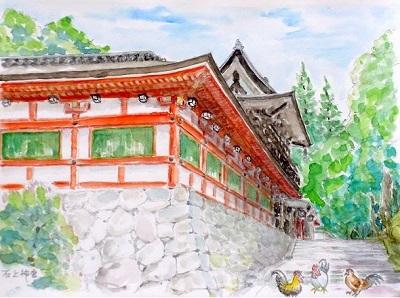 This temple seems to be an old temple where Kobo Daishi was established in 824 AD. There is an approach where the azalea hedge continues on both sides as you go through the gate. Going through this approach, there is the Bell tower gate. This gate is designated as the oldest and important cultural asset in our country, and it was once called the Bell tower gate because the bell tower was suspended in the upper part. 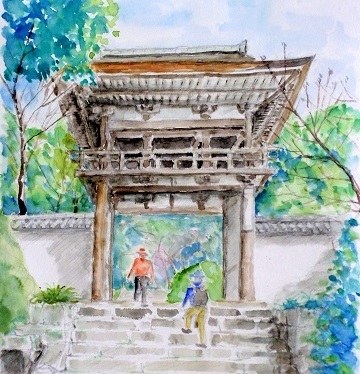 This time I tried drawing this Bell tower gate. As usual, many tourists are visiting Nara Park. Especially touching deer and big Buddha of Todaiji are popular among students of families and school trips. I heard that this Great Buddha was founded by the Emperor Shomu in 743 AD. After that it has repeatedly burned down and rebuilt repeatedly due to civil war and so on. The Great Buddha is seated on the platform, but the figure overlooking the worshiper from the height of 14.7 m was overwhelming even by modern people, maybe I felt such a prestige as to overwhelm the foundation . 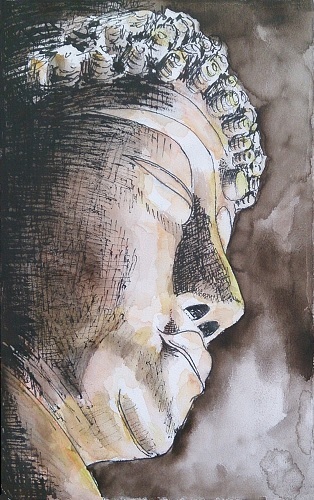 In order to feel such prestige, I tried to draw only the profile face of the Great Buddha. 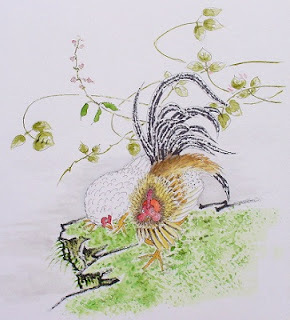 Itoh Jakuchu of an artist who played an active part in the Edo period. Many have been introduced at exhibitions and TVs. This work depicts a cuddling chicken lumping together under the branches of Kidney beans. 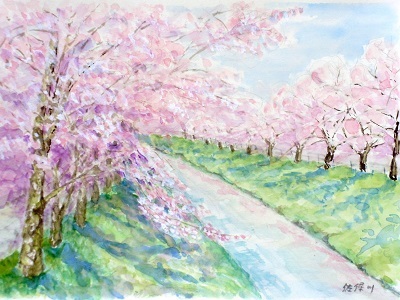 I painted a watercolor painting by slightly changing the composition of this work.